With The Sunkiller Affair out and selling it’s now time for me to focus on book six. I’m about a quarter of the way into the draft and it’s shaping up nicely, though I’m still at that stage in the story where it hasn’t quite gelled from my rough plan into anything resembling its final form. If I’m lucky I should have book six out by the end of the year. 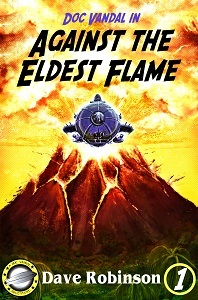 In the meantime, I’ve sent out my first newsletter, and also done a little bit of promotion for Against the Eldest Flame, which appeared in the June 18-24 edition of the SFF Book Bonanza. Also, if you like my work, don’t forget to review and share it. As of yesterday, June 14th, 2018, Doc Vandal Book 5, The Sunkiller Affair is live in the Kindle Store. It’s going to take a bit of time to get indexed and linked to the rest of the series but it can be reached through the link in this post as well as the cover image on the sidebar. Join Doc, Vic, and the crew as they try to save the Earth. Also, for those interested, I should have my first newsletter going out sometime next week. It’s been a bit crazy lately so things are taking more time. Enjoy Sunkiller while I plug away on The Ziggurat of Doom. 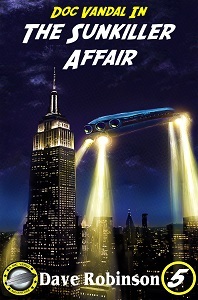 At about one o’clock this morning I finished the first draft of Doc Vandal Book 5, The Sunkiller Affair. Clocking in at 61,051 words it’s the longest book in the series so far, taking most of the characters somewhere they have never been. I plan on spending the next few days working on the next book, The Ziggurat of Doom, before moving into the editing phase for Sunkiller. In other news, I’m also planning on starting a newsletter, with the first issue due out at the end of the month. Sign up for more news on Doc, Vic, and their world. Author Dave RobinsonPosted on March 5, 2018 March 5, 2018 Categories Doc Vandal, WritingTags Doc Vandal, Sunkiller Affair, Writing, Ziggurat of DoomLeave a comment on Sunkiller Done! Doc Vandal book 5, The Sunkiller Affair, is almost draft complete. I’m about 53,000 words into it and have three or four scenes to go. It’s taken longer than I liked to get here, but I’m pleased with the results so far. I just finished submitting Giant Robots of Tunguska for print publication. It should be showing up on Amazon in the next day or two. 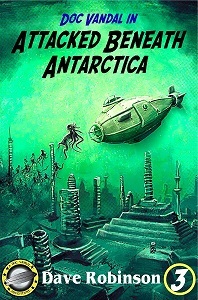 As usual, the paperback will be $9.99 and feature the cover art of Carlos Balarezo. Author Dave RobinsonPosted on January 25, 2018 Categories Doc Vandal, WritingTags Doc Vandal, Giant Robots of TunguskaLeave a comment on Giant Robots in Print! 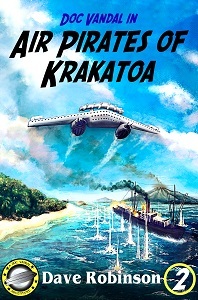 Giant Robots of Tunguska is now live in the Kindle Store. When Vic’s cousin appears on Doc’s doorstep, it’s not long before the team is plunged into an adventure that will take them half way around the world on a mission of life and death. Vic’s reaction to a strange alien mineral has made her the strongest being on Earth. It’s also killing her. Her only hope lies underneath a Soviet labor camp deep in the Siberian wilderness. Driven by a need she cannot comprehend Vic leads the team into a war zone with the fate of the very planet on the line. Meanwhile, Doc and the rest have to try and save Vic without sparking a world war. …and what about those Giant Robots? Don’t forget… The Sunkiller Affair is on the way. Author Dave RobinsonPosted on November 6, 2017 Categories Doc Vandal, WritingTags Doc Vandal, Giant Robots of Tunguska, Sunkiller AffairLeave a comment on Giant Robots Are Go! Pre-orders for Giant Robots of Tunguska are now live on Amazon! Author Dave RobinsonPosted on October 31, 2017 Categories Doc Vandal, PulpsTags Doc Vandal, Giant Robots of TunguskaLeave a comment on Pre-Orders are Live! Welcome to Yesterday's Tomorrow Blog at WordPress.com.